My grandfather worked for Elgin Watch Co. in the 1950s, the first large watch company based in the Midwest. 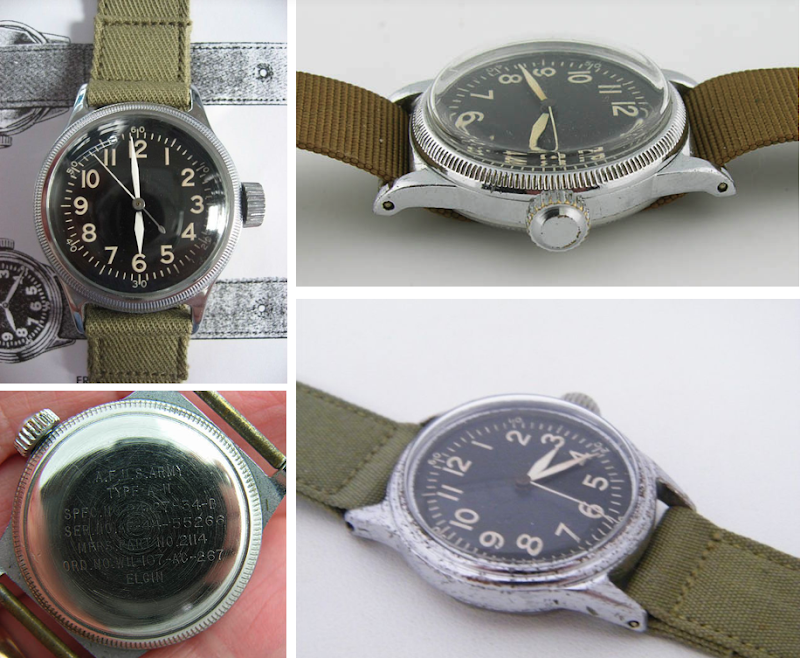 During World War II Elgin produced the A-11 military issue wristwatch that is, according to J.Crew, the inspiration for their Timex military-inspired watches (although these guys would disagree). Now I can't help myself: I'm on the hunt for an A-11. How cool would it look with a great nylon strap or maybe something crocodile? If you need me, I'll be on eBay for the next two weeks. I work for a new timepiece company called MARCH LA.B. All of our pieces are inspired by the most exceptional watches of the past. We make a style called the AM1 Hunter Commando with the exact kind of strap you're looking for. Wow. This is so cool, I like this way better an the J.Crew version too. My dad is obsessed with watches, and has bequeathed many to me -- some I love, some not so much. We both share a love for military or "trench" watches as they are called. I'll have to take some pics of the collection and post them on my blog sometime. My first watch was a Swatch, my second was a Swiss Army and my most recent favorite is my 9k Benson from the 30s. love the simple, utilitarian style of these watches! see you on ebay! I would also like a watch like this... Sends exactly the right kind of message. Thanks for blogging. That’s the most awesome info I have found on this topic. Just found this post from the newer watch one. I have my grandfather's Elgin watch and it looks just like this, but has a white face. I currently have a stretch silver band on it, but have changed it over time. I've had it forever and wore it before men's watches were cool. It runs beautifully. Thanks for this great post. Love your blog!